Winter can really have its share of good and bad moments. The good, of course, is living up to its reputation during the holiday season as “the most wonderful time of the year”. But there can also be a nasty downside to winter when snow and ice intrude on the otherwise positive spirit of the season. The inclement weather can put your facility at high risk for equipment breakdown and work-related accidents. While a planned maintenance visit is an excellent first step, let’s take a look at some ways you can bundle up your facility. During the winter months, a significant portion of the accidents you see can be attributed to the accumulated snow and ice. Accidents can be especially prevalent when there is a drop trailer transaction. During this, a trailer is detached from the semi and placed on its landing gear. This can be even more dangerous in the winter because of the possible snow and/or ice that has built up beneath the loading dock. Now, when a forklift enters and leaves the trailer, the inertia can cause the trailer to creep away from the loading dock. This has now become an environment that can lead to serious accidents. 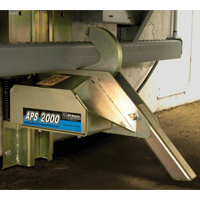 To prevent trailer creep, make sure you have a reliable vehicle restraint, such as the APS2000®. This reliable unit hooks the trailer into a safe position, thereby nixing many creep-related issues. 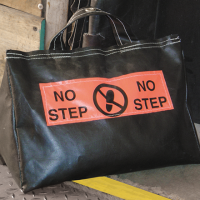 In addition to a vehicle restraint, utilizing OSHA-recommended Hold Safe Stabilizer will provide enhanced support during a loading dock transaction. The stabilizer reduces accidents from a trailer-tip and landing gear collapse. An additional way to protect workers and forklift drivers is to make sure your outside LED communication lights are working correctly and up to date. Such critical light displays communicate the vehicle restraint’s status and let everyone involved know if the loading dock is safe to use. We also recommend adding Reflect & Guide stripes to the outside of your dock to help drivers make better moves and decisions during heavy winter precipitation. Finally, revamping the condition of your dock shelters/seals can go a long way toward keeping outside elements from entering your building. We often see companies who are reluctant to continuously monitor the status of a dock shelter during the winter season. They end up suffering a variety of consequences as a result. A well-conditioned and maintained dock shelter will not only help drivers navigate into the loading dock, they’ll limit the amount of snow and debris from entering the loading dock itself. Preparing the inside of your facility’s loading dock is also a critical component of the winterization process. During times when the loading dock is open, snow can enter the facility making the floor slippery and unstable. You can help safeguard yourself against this with having a few different products and methods at your disposal. As stated earlier, a well-maintained dock shelter is an important asset that helps keep snow off your loading dock. But frankly, a dock shelter doesn’t keep everything out that winter might throw at you. 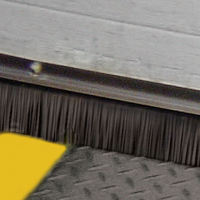 To protect your loading dock even better, the extra effort taken to install Weatherseal on your leveler and doors will help to further keep the elements out. They work to maintain a dry dock and will help save on excessive energy costs at your facility. Wet surfaces inside your facility increase the potential for accidents and injuries. Those are issues that you can certainly live without. With your loading dock interior effectively sealed from the elements and the outside performing at optimal levels – including positive driver/dock worker communication and properly working trailer restraints – you might think there isn’t anything else you could possibly do, right? Another simple solution to consider would be adding the presence of a Dock Stufr. A product of this variety would be manually placed in the corners of the loading dock when a truck is being loaded/unloaded. Dock Stufrs close the gaps between lip and bumper that can be exposed even with a well-managed dock shelter/seal. 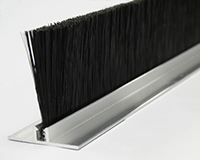 These products do well keeping the facility protected against even the smallest areas that precipitation may be able to seep in. Now that your loading dock is fully prepared for the winter season — both inside and out — you can sleep a little easier. Winter can be treacherous unless you plan well ahead, so don’t let the season fully set in before you’ve properly prepared. If you’re interested in loading dock products perfect for winter safety and energy savings, feel free to contact us by phone (262-518-1000) or email (info@apsresource.com). And for avid social media users, you can find APS Resource and other industry updates on LinkedIn and Facebook.